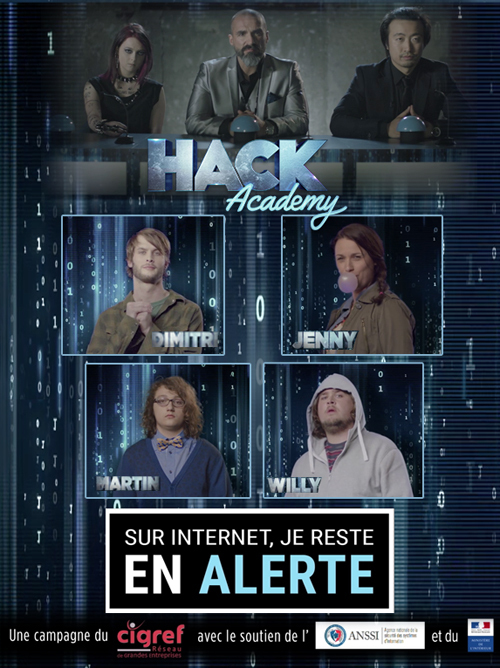 CIGREF undertakes many actions in the field of cybersecurity: information, education, publications, awareness… After creating a serious game called “Keep an Eye Out” designed to involve company’s employees in preventing digital risks, CIGREF now raised a public awareness campaign, called the “Hack Academy “. Initiated on October 1st 2015, this campaign wants to raise awareness among citizens through 4 episodes addressing 4 different digital risks one’s can be exposed to. Raising awareness about cyber security is far too important to be tackled ”seriously”. This is why, Pascal Buffard, President of CIGREF says that, to launch this campaign, humor appears as a better way than fear. “First, using the metaphor of reality shows enables us to address a larger audience Secondly, using the stereotype of the Hacker that we usually see in movies, could be meaningful to everyone”.